Our context is the contemporary international scene and our composers share some of the best facilities in Europe with their performing contemporaries. Our critically acclaimed annual festival, Plug, has become a renowned platform for new work. Professional groups, including Red Note and Hebrides Ensemble, have also premiered over 30 student compositions as part of our ongoing public masterclass programme. As a student composer you’ll also benefit from our excellent cohort of student performers. Capable of a range of professional performance, you won’t be limited to composing in a certain way for certain types of players, but will be free to develop your own compositional ideas. We offer high contact time of 90 minutes one-to-one tuition each week. As working artists with various areas of expertise, our tutors bring live projects into lessons helping you to explore your own compositional voice. Together with your tutor your end of year portfolio will be negotiated, not prescribed. Every student embarks on their own learning journey; you can pursue a second study, work in the superb electroacoustic and recording studios, or devise new work in our purpose-built performance venues. There’s also a real sense of a community among our students, staff and PhD cohort. The Composers Forum meets every Thursday and might include visiting composers and poets or perhaps a chance to discuss your work. Involving the full department, it’s an opportunity to listen to styles of music which you may not have heard or considered before and can help to challenge the orthodoxy and even your own ideas. You may also discuss work by PhD students who are engaged in larger works not experienced in earlier years of study. Our students have also set up their own Composers Collective which meets every two weeks to discuss different musical influences. Composition can be a solitary existence and at the Royal Conservatoire we develop the skills to work with other artists. One of the best things about the Royal Conservatoire is our diversity, not just among musicians but across the whole institution. Due to differing artistic influences our students have developed a number of stand-alone projects in dance, theatre, film, and musical theatre. Different work in a range of different contexts makes us exciting and continually challenges our work. As Scotland’s national conservatoire we’re also approached countrywide with requests for new commissions and students often arrange their own performances of new work across Glasgow’s vibrant city centre. By studying here you’ll be working with our diverse and talented performing community and will enjoy outstanding facilities and professional partnerships. Creative artists create because they have something in them they want to say. At the Royal Conservatoire we not only help you do that but also prepare you for the realities of professional life. The Composition MMus degree course shares many attributes with the BMus degree and this facilitates the cross fertilisation of ideas from a similar discipline across degree structures. 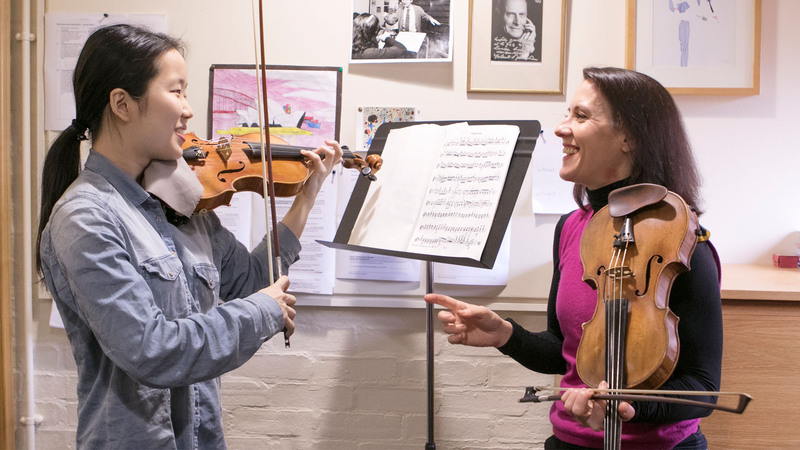 By design there is strong dialogue between composers of all levels of experience at the Conservatoire from undergraduate, postgraduate through to research, which creates a strong and supportive learning environment. In addition to a weekly ninety minute lessons, the Masters composers is encouraged to develop their own personal directions and these are taken into account when learning journeys are agreed at the beginning of each academic year. There is the choice for collaboration across the Conservatoire’s Schools and weekly Composers Forums and seminars. The Composition Department has a full suite of Computers which are equipped with the industry standard versions of Sibelius, Pro Tools, and Max/MSP as well as other software designed to engage the compositional process. We have three electroacoustic music studios and one recording studio, a full sized Indonesian gamelan, and are about the ship from Los Angeles one of the former student and Rhythm Theory expert Steve Forman’s exciting collection of working exotic percussion to become part of the Department’s permanent collection. Many of our graduates have formed and instigated ensembles and music events in Glasgow which in turn have fed back into the learning culture of the Conservatoire, most notably ensembles Thing, Symposia and the Glasgow New Music Expedition and experimental music events such as Engines, Gregor Samsa and Eyegrid. Most of our graduates have become professional composers working in the world of classical contemporary music with commissions and residencies from amongst others the Royal Scottish national Orchestra, RedNote, the BBC, Scottish Opera, Royal Opera House and Ensemble Modern. After making an application through UCAS Conservatoires, Composition applicants should submit a substantial portfolio of recent compositions together with recorded performances wherever possible. Explanatory notes can, if appropriate, be submitted. Portfolios must be submitted online using Acceptd. An interview with the Head of Composition will assess the applicant’s suitability for the programme. It will focus on the applicant’s composition portfolio and on the provisional elective choices of study outlined in the application form. If you audition by recording your portfolio will be assessed only for entry. After making an application through UCAS Conservatoires, Composition applicants should submit a substantial portfolio of recent compositions together with recorded performances wherever possible. Explanatory notes can, if appropriate, be submitted. Portfolios must be submitted online using Acceptd.